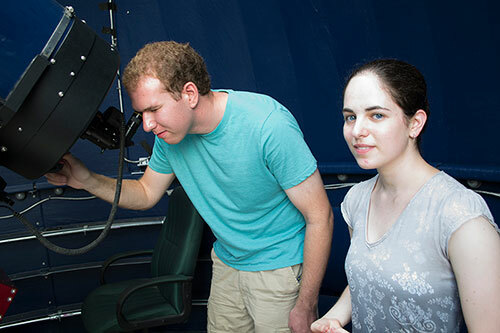 Alexandra Cramer, right, and Jacob Gunnarson in 2015, prepare to use William & Mary’s Thomas Harriot Observatory. Cramer is pursuing her love of astronomy through physics. She was recently named recipient of the Jefferson Science Associates Minority/Female Undergraduate Research Assistantship at Jefferson Lab. Photo courtesy of Joseph McClain/William & Mary. NEWPORT NEWS, VA – Alexandra Cramer has always been interested in science. Growing up, her family took her to air shows, nature centers, and astronomy observation nights. “And they all appealed to me, especially the astronomy,” she commented. In high school she discovered that the best foundation for pursuing her love of astronomy as a career was through physics. That drive and interest in physics has led to her selection as the latest recipient of the Jefferson Science Associates (JSA) Minority/Female Undergraduate Research Assistantship (MFURA) at Jefferson Lab. JSA established the MFURA program to provide opportunities to minority and female students who are pursuing undergraduate degrees in physics, giving them a chance to turn their studies into real-world research applications and experience. Cramer is excited to begin her work with the GlueX data. “Contributing to Jefferson Lab research will be a great opportunity to work with large amounts of data, and I think it will be neat to examine a data set and progress from reading lists of numbers to describing the characteristics of protons,” she said. Stevens noted that Cramer is in an honors program, where she will complete an Honors Thesis Project related to her Jefferson Lab research during the 2017-2018 academic year. Cramer previously worked as an intern at NASA’s Goddard Space Flight Center and plans to pursue a career in astronomy. “Her data analysis experience from NASA will be very useful in her GlueX data analysis, especially the different analysis techniques that she used in her internships,” Stevens pointed out. The assistantship, which begins this month, gives Cramer a stipend for a year and travel money. It is supported through the JSA Initiatives Fund Program, which is funded annually by the JSA owners, SURA and PAE Applied Technologies. Initiatives Fund monies are awarded every year to support activities that further the scientific outreach, and promote the science, education and technology missions of Jefferson Lab, according to Elizabeth Lawson, JSA Initiatives Fund program manager. “The Minority/Female Undergraduate Research Assistantship provides unique opportunities for recipients to gain valuable experience with the lab's physics research program while they are completing their undergraduate education,” Lawson said.